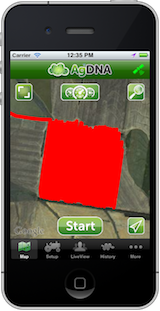 Can an app help my farm? You bet, and it’s FREE! My name is Paul Turner and I founded AgDNA to help growers around the world streamline their farming operations. Having worked in the agriculture technology sector for over a decade, like many, I waited patiently for an app to make farming easier… I got tired of waiting! So I assembled the best app and web developers from around the world to create AgDNA. It’s built from the ground up so it works works with all modern web browsers, iPhones, iPads and GPS accessories. Over the coming months you’ll hear more about the capabilities of AgDNA and how it can help your farming operation. You’ll also find out what our test farmers are saying around the world and how AgDNA is improving their in-field efficiencies. We’re now beta testing across three continents and receiving awesome feedback. If you would like to keep up to date on our progress then feel free to register on our home page at http://www.agdna.com to receive updates and be one of the first to download the free app when we launch. Thanks for checking out AgDNA and stay tuned to hear more about the most exciting app in agriculture!